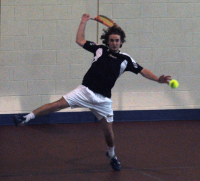 Quinnipiac’s Micah Bailey returns a volley in Sunday’s match vs. Saint Francis (Pa.). 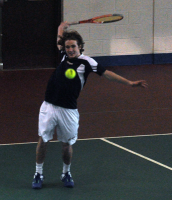 Quinnipiac’s Andrew Weeden returns a volley in Sunday’s match vs. Saint Francis (Pa.). Quinnipiac’s Andrew Weeden hits the ball in Sunday’s match vs. Saint Francis (Pa.). Quinnipiac’s Andrew Weeden reaches for the ball in Sunday’s match vs. Saint Francis (Pa.). 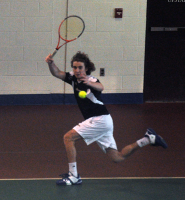 Quinnipiac’s Andrew Weeden backhands the ball in Sunday’s match. 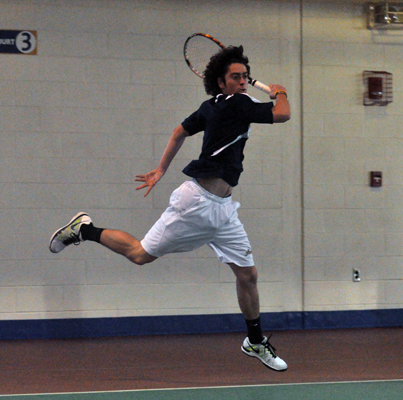 Quinnipiac’s Eric Ambrosio returns a serve in Sunday’s match vs. Saint Francis (Pa.). 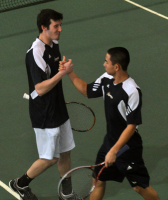 Quinnipiac’s Garrett Lane and Eric Ambrosio embrace each other after winning a point in Sunday’s match vs. Saint Francis (Pa.). 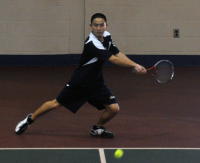 Quinnipiac’s Andrew Weeden serves the ball in Sunday’s match vs. Saint Francis (Pa.). Quinnipiac’s Garrett Lane tosses the ball in the air before a serve in Sunday’s match vs. Saint Francis (Pa.).